Catalogs are now available by mail and online for the Texas Arabian Breeders Association (TABA)'s annual race horse sale that is scheduled for Saturday, April 8 at Retama Park. The live auction will take place in Retama's saddling paddock. Barns will open at 10:00 a.m., and the auction will begin at 1:00 p.m. Among the top racing prospects consigned to the auction is afull sister to the 2006 winner of the $100,000 Daughters of the Desert Oaks. To view the catalog online, including horse pedigrees and photos, click here. To request to have a catalog mailed to you, call (972) 564-9430 or e-mail your request to auction@texasarabianbreeders.com. Among the top racing prospects consigned to the auction is a full sister to the 2006 winner of the $100,000 Daughters of the Desert Oaks. No open barns on Thursday, April 6. 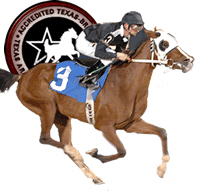 TABA Board Member Dan Woods will be calling each consignor to arrange when they can come into Retama. Friday morning gallops must be arranged by the potential bidder with the consignor. Friday, April 7 - Barns open 10:00 a.m. until 6:30 p.m.
Saturday, April 8 - Barns open at 10:00 a.m., Live auction begins at 1:00 p.m.